This article was written by and published in Contractor Magazine and can be viewed here in its original format. Copeland refused to let her new “normal” put limitations on her lifestyle. She lives in her own, one-story home in a redeveloping area of downtown Atlanta. The challenge lay in making Copeland’s home adaptive to her needs. The existing kitchen sink was not accessible, nor was her laundry area and pantry sufficient for her needs. Inspired by Copeland’s story, MRP Design Group provided their service and materials for the project. ATLANTA — In 2012, adventurous, independent graduate student Aimee Copeland decided to celebrate finishing her school classes by vacationing with friends near the Little Tallapoosa River in Georgia. During the trip, Copeland fell in a river when a zip line snapped, suffering a deep cut in her leg, which caused her to contract a flesh-eating bacterial disease that spread throughout her body. During her struggle to survive, doctors were forced to amputate both of her legs and hands. Copeland refused to let her new “normal” put limitations on her lifestyle. She recently graduated with her second master’s degree in social work and hopes to build a holistic center for people with disabilities. She also lives in her own, one-story home in a redeveloping area of downtown Atlanta. Copeland loved the home’s open space floor plan, but it required substantial modifications to make it more accessible for her needs. Inspired by Copeland’s story, MRP Design Group, an architectural and engineering firm in Atlanta, provided their service and materials for the project. 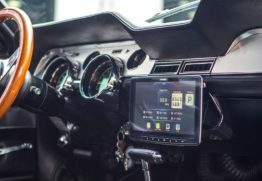 The firm also reached out to professional and personal connections. 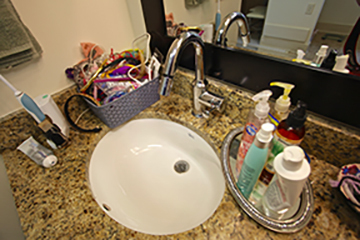 Notified of the project by manufacturer’s rep, Harry Warren Inc. of Georgia, American Standard Brands offered to donate $14,000 worth of specialty ADA-compliant bathroom fixtures for the renovation. The challenge lay in making Copeland’s home adaptive to her needs. The existing kitchen sink was not accessible, nor was her laundry area and pantry sufficient for her needs. Copeland wanted the freedom of a screened veranda and a deck that was large enough to enjoy with plenty of room for guest seating and open thresholds that did not create barriers. The front steps were not even accessible without a new ramp. The largest challenge was limited space in the 4 feet x 7 feet master bathroom, including the standard size tub, and her wheelchair was too wide to fit through the doorway. As a result, Copeland had to rely on constant assistance anytime she needed to use the bathroom — an embarrassing frustration for a self-sufficient woman. Therefore, the space needed to be expanded and reconfigured in order to provide wheelchair access. However, Copeland faced an obstacle before any work could even begin. When her house was built in 1920, there were no regulations for the space between the property line and one’s home, and many were built two feet from the lot line. The original builder thought they were being gracious by putting the foundation almost four feet from the property. Unfortunately, modern regulations created a set-back of seven feet. As a result, in order to construct the planned 800-sq.ft. addition in line with her existing house, Copeland needed to apply for a variance to the current zoning code. Otherwise, the renovation would have to be reworked, adding excessive length and expense to make up for a re-configured width. Finally, after eight months, a lot of paperwork and with the support of every close neighbor, Hawkins said the higher levels of the city Zoning Board overruled initial objections and welcomed Copeland to the city. The transformation began in August 2015, when builders began excavating a foundation for the 800-sq.ft. bedroom expansion. Immediately, they ran into a serious problem. 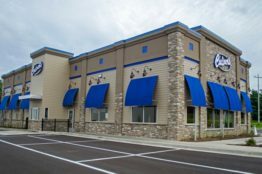 Two weeks later, after rough framing was complete, workers began tiling and installation of granite, cabinetry and the ADA-compliant fixtures — the renovation and addition was complete. B.R. Loggins Plumbing of Jasper, Georgia, installed the plumbing fixtures. A key addition to the new bathroom is a deep and spacious massaging walk-in bath, which offers many therapeutic benefits to Copeland, such as the built-in comfort seat. 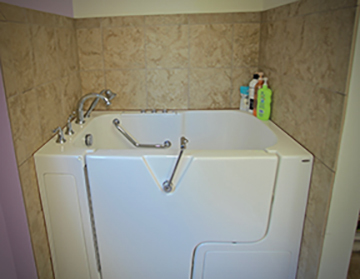 The walk-in bath also features a large, watertight door that swings outward, providing more room when entering and exiting the tub and allowing for a safer wheelchair transfer for Copeland. 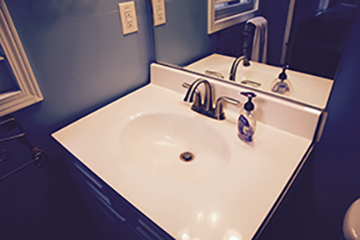 Prior to the renovation, the deck of the bathroom sink was situated too low to allow wheelchair access. A new undermount sink with a pull-down faucet, originally intended for bar applications, provides the flexibility and functionality that Copeland needs. Copeland also needed a shower setup that would give her more bathing independence. 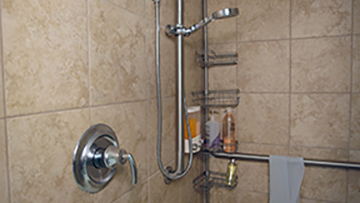 Previously, she did not have a roll-in shower, which allows a wheelchair to maneuver all the way into the shower stall. Copeland’s modified bathroom represents merely one aspect of adapting to her “new normal.” Accommodating devices throughout her home — from a wall-mounted hair dryer to an adjustable cutting board — all help her live self-reliantly. Ultimately, though, these are all just tools that pale in comparison to the most adaptive element of Copeland’s new life — her unwavering, independent spirit.